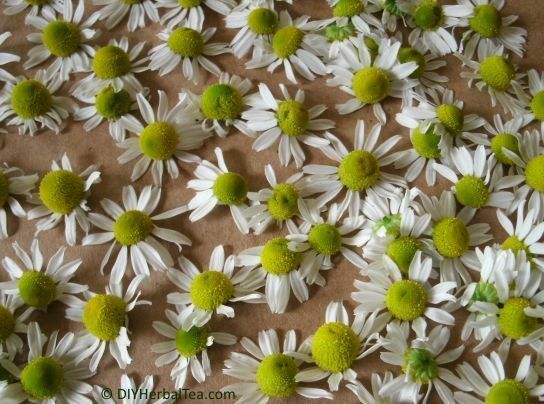 What to do when your garden is overflowing with fresh herbs? Dry some. Freeze some. 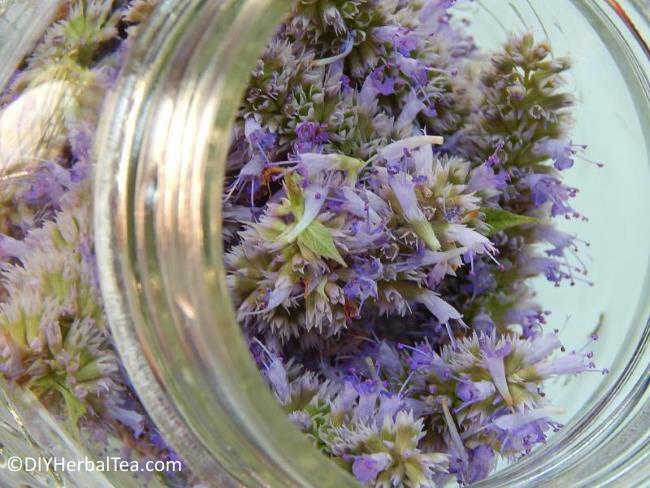 Start your personal "stash" of homegrown herbal tea! 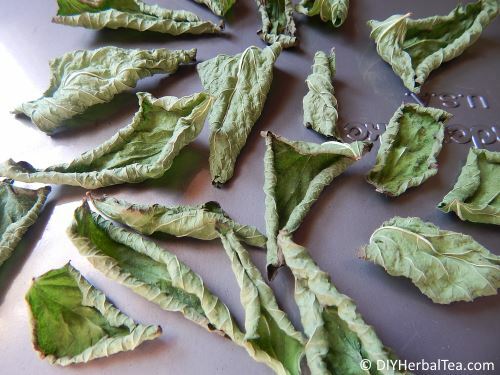 My first foray into the wonderful world of at-home herb drying was a real eye-opener! After much trial and error (more error than I care to admit! 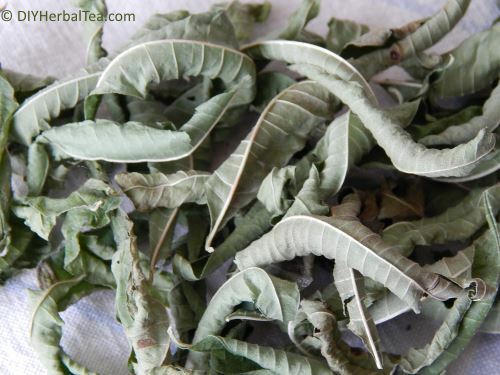 ), I learned that some drying methods preserve an herb's true flavor better than others. There's no such thing as "one size fits all" when you're preserving fresh herbs. Note: I've marked the best preserving methods for each herb with an "X". An asterisk (*) means the method will work, but your results might be less than spectacular. Always start with freshly-picked herbs. Resist the temptation to harvest more than you can realistically dry or freeze at one time. 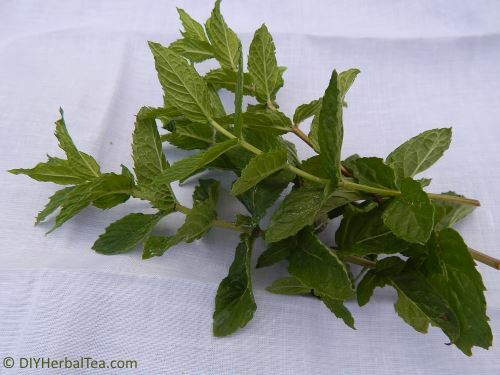 Be sure your herbs are clean, dry, and free of insect or animal damage. Get all your preserving equipment (see below) ready before you head out to the garden to pick your herbs. Cut a handful - or a basketful - of herbs from your garden. 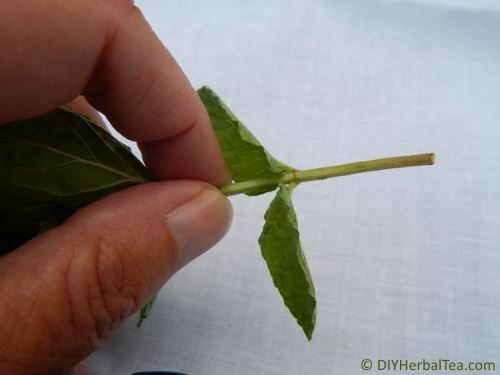 Strip all leaves from the bottom 1½ inches (3.8 cm) of each stem. 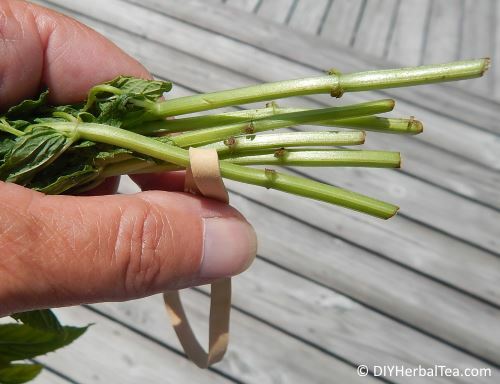 Gather 5 or 6 stems together in a bunch, and wrap the bunch with a piece of twine, a rubber band, or a twist tie to hold them loosely together. 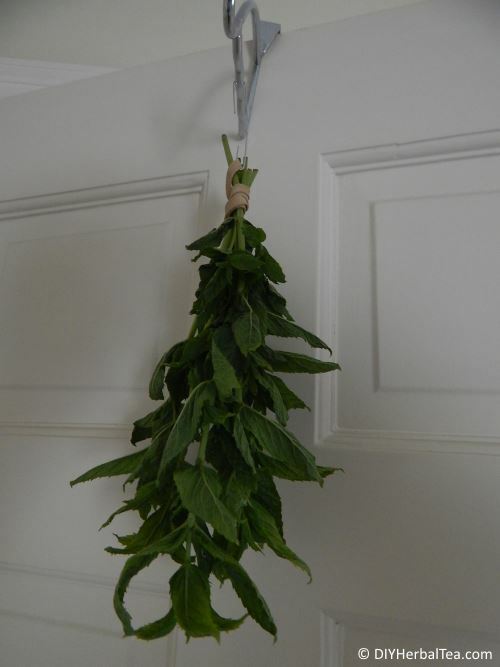 Yep, my herbs are hanging from an over-the-door clothes hook. I was running out of space on the drying lines I had strung across the room, so I was forced to get creative with places to hang more bunches. 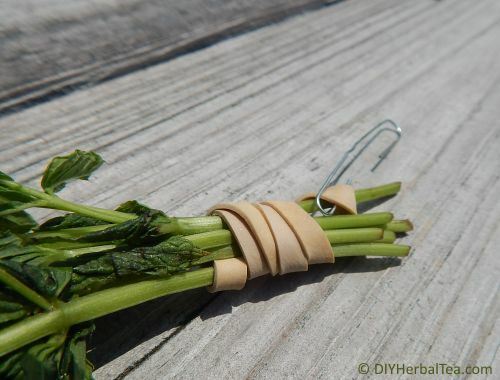 When your herbs feel crunchy-dry, strip them from their stems for storage. If you're thinking of hanging your herbs in your garage or basement to dry, think twice about that. Your basement might be more humid than you realize, leading to moldy herbs. And garages collect some really nasty fumes. 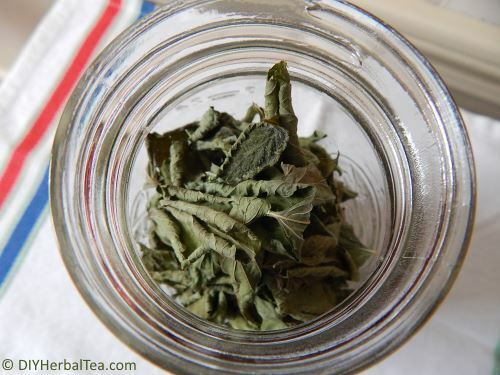 You don't want those fumes seeping into your tea herbs. Ick! Are you short on hanging space? 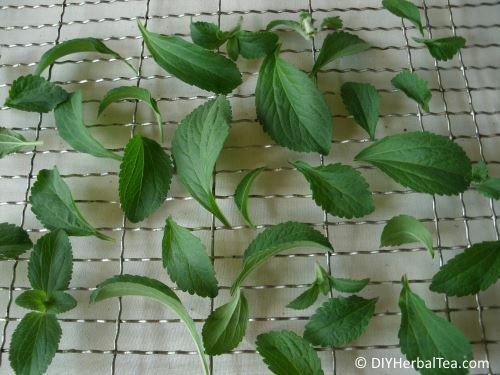 Lay your herbs on a flat surface to dry. 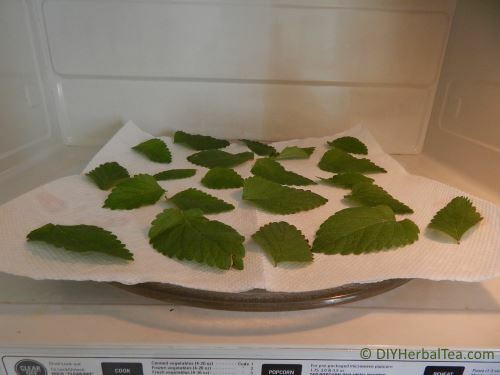 For larger leaves, a wire baking rack is a handy drying tool. The rack allows for good air circulation under, over, and around each leaf. If your leaves or flowers are small, they might fall through the holes on a baking rack. If that happens, spread them out on a clean cloth or paper. They'll dry just fine. Leave your herbs in a well-ventilated, humidity-free, shady place to dry. Important: Check your herbs every day. If you notice any moldiness, or even the barest hint of a musty odor, throw those herbs away and start over ... with a fresh harvest and less-humid drying conditions! The secret to success with this method is having an oven that consistently holds a super-low (90°F /32°C or lower) temperature setting. If your oven temperature spikes and drops, you might want to try a different drying method. Remember, our herbs are precious! We want to dry 'em - not fry 'em!! Pre-heat your oven on its lowest temperature setting. 75-80° F (24-27° C) is perfect. 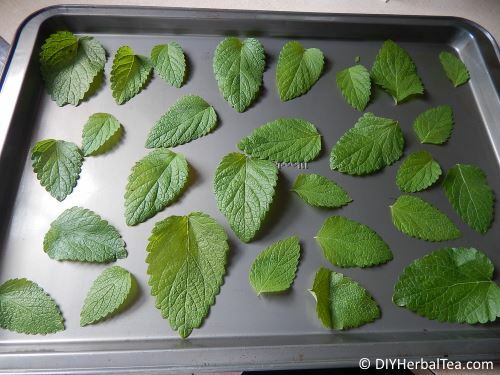 Spread your clean, dry herb leaves or flowers on a baking sheet. Pop the baking sheet into the oven. Leave the oven door slightly ajar to allow some air circulation. Check your herbs regularly. As soon as they become crispy to the touch, they're done! TIP: Check the temperature inside the oven before you turn it on. You might be surprised how warm it is in there - maybe warm enough to dry your herbs without cranking up the heat! Frankly, I was pretty skeptical about microwave drying herbs. 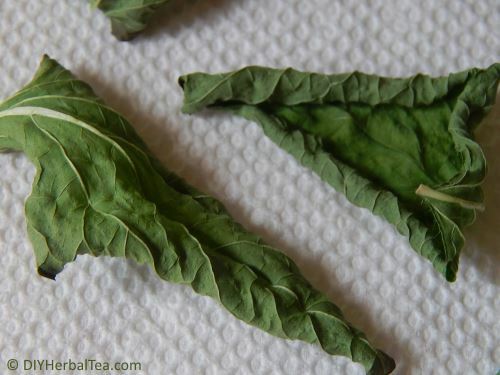 Until I tried it myself ... and discovered that some tea herbs hold their true color and flavor really well when they're dried in the microwave. Set your microwave to the lowest possible power setting. Press "start" and zap your herbs for 30-40 seconds. Stop. Check your herbs. If they're not dry, zap 'em again for a little shorter time. Zap. Stop. Check. Repeat. Keep going, using shorter and shorter zapping times, until your herbs are just crispy dry to the touch. Be extra-careful when microwaving herbs. In a matter of a few seconds, a delicate flower or leaf can go from perfectly dried, to destroyed, to on fire! TIP: Open the oven door and allow your herbs to "rest" for a minute or two between zappings. That accomplishes two things: (1) it allows you time to test for done-ness; and (2) any humidity that's built up in the oven will be released, leaving less moisture to re-invade your herbs. When your herbs are fully dried, let them rest another 30 seconds or so, then put them into an air-tight container for storage. During the growing season, my food dehydrator gets more use than any other appliance in my kitchen. Yeah, it's true - I'm not big on cooking. 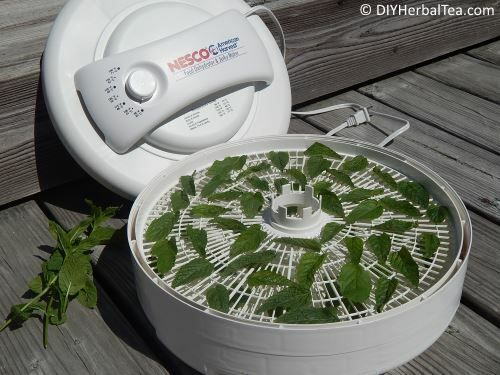 ;-) But I can't live without my dehydrator for drying fresh herbs! I load 4 or 5 trays with freshly harvested "tea", turn the trusty machine on to the lowest temperature setting, and walk away. The drying temperature stays steady, no heat fluctuations to screw up the process ... and in a matter of hours, my herbs are nice and crispy dry. Note: Each brand of dehydrator operates a little differently. So be sure to follow your manufacturer's instructions for best results!